Home > Questionnaires > Questionniare: Is Yours a Top Recycling Household? People can get awfully competitive over the things they do, and for some of us, recycling is no exception. Comparing our personal ‘diversion rate’ may not yet be an Olympic sport, but that doesn’t stop us sometimes wondering just how well we are keeping up with the Joneses – or the Adebayos, Patels and Liangs too, for that matter! If you’ve ever wondered just how well your household ranks in the recycling stakes, then here’s your chance to find out, with our quick, fun quiz. The answers are at the bottom, so good luck and enjoy finding out. 1. Which of the following do you regularly recycle? j) Domestic electrical or electronic items. 2. Which of the following do you have at home, right now? a) A compost bin or wormery. b) One or more bins specifically for recycling. c) One or more non-plastic shopping bags. 3. How often do you or someone in your household buy products that are made from at least some recycled material? a) Once a week or more. b) At least once a fortnight. d) A few times a year. 4. What do you do with unwanted household items that are in good condition? Pick the ONE that you do most often. a) Give them to friends relatives. b) Send them for recycling. c) Throw them out as rubbish. d) Advertise them in a local free-cycling service. e) Sell them on eBay or at an auction. f) Donate them to charity. 5. Which of the following do you have in your garden? c) A brush for scrubbing plant pots for reuse. d) Any kind of solar or low energy light or water feature. e) Any furniture made, or part-made, from recycled material. 6. Which of the following have you EVER recycled? c) Easter egg cartons or empty chocolate boxes. d) A fridge or other large kitchen appliance. e) Unwanted or broken furniture. 7. Roughly how much of your waste do you recycle on average? 9. How much do you think you will be recycling IN THE FUTURE? 10. Would better/wider local recycling facilities encourage you to recycle more? 1. One point each – and if you scored all 10, give yourself TWO BONUS POINTS! 2. One point each – and ONE BONUS POINT if you really do use those bags every single time you shop! 3. (a)5, (b)4, (c)3, (d)2, (e)1. 4. (a)2, (b)2, (c)1, (d)2, (e)2, (f)2. 5. One point each – and another BONUS POINT if you scored five out of five. 6. Another one point each – plus a BONUS POINT for getting all five. Are you a top recycling household? I should say so! 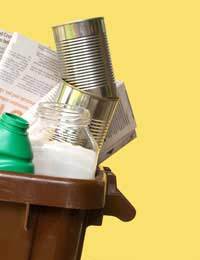 Don’t leave anything lying around in your home, or it’ll be heading off to the appropriate recycling bin in double-quick time! Seriously, if you’re sending that much waste to be recycled, then you certainly don’t need the likes of this quiz to tell you you’re doing a great job – so well done, and keep up the good work. Not quite a top recycling household yet, but you’re definitely up there with the best. If you answered ‘a’ to question 9, then it’s only a matter of time! Currently recycling isn’t a major priority for you – or it may be that you simply live in one of those parts of the country where facilities are not particularly great and recycling anything is a major achievement. Whatever the reason, you may not be a top recycler today, but there’s always scope to change that in the future, if that’s what you want to do. Is that really possible? Not even a shopping bag or a compost bin? I don’t believe you – you’re having us on!